> Interactive Intelligence > Business as Usual - How Much Is It Costing you? 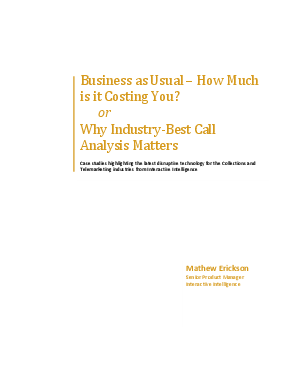 Why industry best call analysis matters -- Case studies highlighting the latest disruptive technology for the collections and telemarketing industries from Interactive Intelligence. Through these case studies, learn about telemarketing, collections and various stories about positive results of a media server and more.